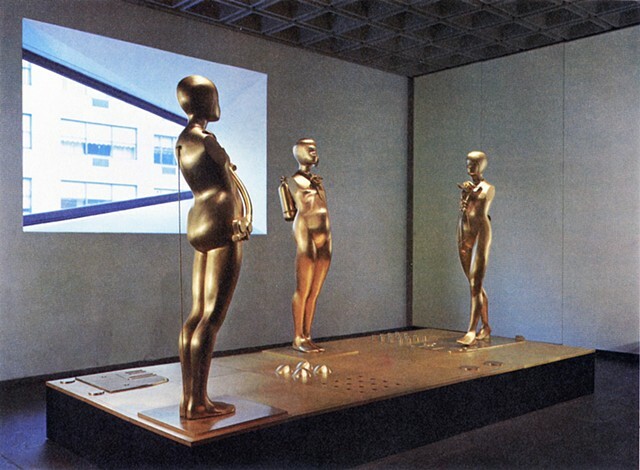 In the late 1960s and early 1970s, Ernest Trova was among the most widely acknowledged sculptors working in the United States, resulting in invitations to exhibit in three Whitney Annuals, three Venice Biennales, and Documenta 4 in Kassel, Germany.i In 1969 his work was heralded by the New York Times as among the best of contemporary American sculpture, and throughout those decades examples of his art were prominently displayed in dozens of major museums including the Museum of Modern Art, the Whitney Museum of American Art, and the Walker Art Center in Minneapolis. Trovas life-size bronze, Study/Falling Man (Wheelman), once greeted visitors at the Guggenheims 5th Avenue entrance, and for more than twenty years he was represented by the estimable Pace Gallery, which inaugurated its first New York space with an exhibition of his work. Today Trovas work is neglected in even the broadest art historical accounts of that same period. Anyone active in the contemporary art world of that time can easily recall Trovas once-famous Falling Man series, which employed an armless, pot-bellied male figure as a standardized representation of modern humanity at its most fallible. In paintings and prints, Trovas anti-heroic Falling Man was depicted as a flattened silhouette repeated and repositioned within geometric environments, while three-dimensional Falling Man sculpture was typically realized in chrome, bronze, or stainless steel and polished to mirrored perfection. Trovas Falling Man was a ubiquitous icon of post-industrial distopia that could be seen everywhere from architect Philip Johnsons private gallery at his Glass House to the cover of Time Magazine. There is nothing remarkable about an artist being relegated to obscurity. Art history is replete with forgotten art and forgotten artists, and its not unusual for art careers to rise and fall and settle somewhere distant from their peak an artists reputation that enjoys anything else is the rare exception. The extent to which these specific histories are of interest is a matter of both quality and extremity; the better the artist and the higher they rise and fall, the more curious and compelling their narratives tend to be. If thats the measure, there arent many careers that deteriorated more compellingly than Ernest Trovas, who went from having his art preserved in museums and discussed in history books to having it surreptitiously destroyed by an unscrupulous dealer and sold through shopping mall art galleries within the course of less than ten years. Born in 1927, Ernest Trova achieved his first small success at the age of twenty when the visiting Max Beckmann selected his painting Roman Boy as the winner of the local museums annual exhibition. When the president of the St. Louis Artists Guild publicly declared Trovas work fit only to hang in an outhouse, the row resulted in the self-taught artist and his partially dripped painting being pictured on a full page of LIFE Magazine, almost two years before Jackson Pollocks star-making turn on the same pages. In the following years Trova continued his ad hoc art education, personally seeking out Willem de Kooning and poet Ezra Pound, whose dual influences would heavily impact the young artists developing practice and philosophy. Trova continued primarily as a painter for the first 14 years of his career, and as early as 1958 could be said to have identified what would become the central impulse of his mature work the serial use of invented abbreviations of the human figure, which developed until he arrived at the wholly elegant collection of human curves that would become his breakthrough construct, Falling Man. By the early 1960s Trova had moved through a phase of large-scale found material assemblages into a cooler, hard-edged painting style. Working on canvas as opposed to the cardboard signage he had retrieved from his jobs in department stores, Trovas paintings of this period were developmental and somewhat unfocused, using subjects as varied as baseballs and cartoon quasi-Nazis, each composed of carefully ruled and stenciled forms that hinted at the formal devices that would result in his breakthrough painting in 1963. These paintings were an important step for Trova into a more contemporary lexicon, distanced from the gestural styles that dominated his paintings of the 1950s. In 1962 Trovas paintings were being advanced in New York and elsewhere by Ivan Karp, Director of the Leo Castelli Gallery, who would also be widely credited with helping to discover Andy Warhol that same year. Karp introduced Trovas paintings to both Castelli (who had a Trova in his own home) and Arnold Glimcher, a young dealer whose small Pace Gallery in Boston was already exhibiting artists as diverse as Warhol, Jean Arp, Claes Oldenburg, and Josef Albers. The most successful of Trovas paintings from this period were those that included his newly minted Falling Man image. Synthesizing post-painterly abstraction with own virtually ancient brand of classicism, Trova had arrived at a result in his initial Falling Man work that attracted immense interest from both critics and collectors. An exhibition of his paintings at the Pace Gallery in 1963 was well received, but his path to international significance would not be set until two years later, when Trova translated Falling Man from painting into sculpture. Realized in three dimensions and fabricated to an uncommonly high standard for the time, Falling Man sculpture assumed an immediacy barely prefigured by the same imagery represented in two-dimensional profile. In both its walking and standing versions, early Falling Man sculpture had many expressions, most successfully using the variously scaled figures as starting points to be amended with repurposed and out of scale medical instruments, spoked wheels, and other castoffs of modern industry. Sculptures of a single Falling Man could very often project playful gravity, and when multiple Falling Man figures configured around menacing landscapes Trovas nostalgic Futurism gelled into singular amalgams of Giacometti and de Chirico filtered through the Art Deco and Machine Age sensibilities that were the high style of Trovas youth. The early sculptural work received tremendous attention; its first exhibition sold out, with Alfred H. Barr, founding Director of the Museum of Modern Art, purchasing three of the sculptures for the museum. The most important private collectors in the country followed suit, including Larry Aldrich, Thomas Hirshhorn, Nelson Rockefeller and Ronald Lauder among many others. Trovas reputation grew exponentially once he arrived at his mature medium of sculpture, frequently exhibiting new work within a roster of artists at Pace that soon came to include Jean Dubuffet, Agnes Martin, Chuck Close, and the estate of Mark Rothko. By the late 1960s Ernest Trova was an established art star whose work enjoyed almost too broad a popularity; his success viewed with suspicion by segments of the art world uncomfortable with the superficial appeal of his sculptures gleaming surfaces and the artists reluctance to frame his work within the current discourse. Part of Trovas reticence to do so was that his art was not propelled by any critical theory as much as by a distinctly personal philosophy, and although his work was often placed within the confines of Pop Art, Trova was never a good fit within any movement. Trova had mastered a brand of figuration that was anathema to the prevailing tendencies that had directly preceded and followed it, and like much of what was viewed through the lens of Pop Art at the time, adherents of New York School abstraction would find as much fault with Trovas work as would the champions of post-painterly abstraction and minimalist sculpture that followed. Trovas advocates believed he had invented an extraordinary symbol of dystopian humanity, but his detractors often complained of the smaller sculptures toy-like qualities and of fatigue with Trova's seemingly endless variations on the Falling Man theme. Not inclined to accept that whimsy and endlessness were both central to Trova's point and process, his harshest critics found Trova's studied classicism regressive, confused his fundamental seriality for a lack of progress, and viewed his chosen materials as too slick or a cheap thrill, rather than a dead-on expression of contemporary man's inseparability from his own time and technology. Perhaps the most frequent criticism leveled against Ernest Trova was an accusation of commercialism. By producing less expensive variants of his art, like a Falling Man wristwatch for the Pace Gallery or a toy kaleidoscope for the Museum of Modern Art, Trova was seen to have crossed a key mercantile line. In light of currently available Claire Fontaine Rubix Cubes, Richard Prince skateboards, and Rudolf Stingel dinner plates, it seems that Trova may have simply been ahead of his time. Udo Kulterman, who provided the text for a large Trova monograph published in 1978, places Trovas interest in egalitarian art objects in the most apt context. Kulterman indentifies Trovas affinity for the mass market as being more rooted in admiration for Walt Disney (Trovas unlikely artistic hero) rather than in any financial motivation. Kulterman observes that Falling Man was to Trova what Mickey Mouse had been to Disney; a character capable of infinite physical and narrative flexibility, undergoing constant displacement and redefinition without losing its essence. Trova very often spoke about Falling Man in terms of cinema, Disneys primary medium, and considered the Falling Man series as a single work-in-progress, with each work of art acting as one frame in a lengthy film. Having firmly established the identity of his trademark image, in 1969 Trova moved away from placing Falling Man into ambiguous narratives and toward self-contained figures segmented and hinged into complex new compositions relying strictly on the forms available within dissections of the figure itself. With the hinged figures the Falling Man series emphasis transitioned from a Falling Man as character phase to a Falling Man as object phase, although Trovas all-purpose Everyman would never be fully absolved of either position (still always a character, still always an object.) Not unlike Giorgio Morandis boxes and bottles, from phase to phase Falling Man was less a subject unto itself than a stepping off point for Trova to address his increasingly refined formal and philosophical concerns. Ernest Trova continued to develop his invented emblem, and by the early 1970s his work was as widely known as almost any contemporary art being made. Throughout that decade his attention moved away from exclusively Falling Man work to several new series of large-scale outdoor steel sculptures, only occasionally incorporating identifiable Falling Man imagery. His Profile Cantos, Abstract Variations and GOX series were distinguished in subtle ways, but were fundamentally too similar to much of the abstract sculpture being made at the time. Of all of Trovas monumental sculpture, only the partially figurative Profile Cantos, in which the artist bent and splayed the Falling Man silhouette over and around elementary steel shapes, resonated with the philosophical strength and formal purpose that are central to Trovas most powerful art. Understandably, Trovas abstract series of the 1970s met with less critical and commercial success than either the artist or his dealer would have liked. In 1985, at the age of 58, Ernest Trova seemed to have settled on the same plateau that many artists do once the zeitgeist that brings them their initial acclaim subsides. In the few preceding years Trovas work had been in shows at the Whitney and the Guggenheim, and while the time of his greatest relevance had clearly passed, he was an established artist with financial security and regular exhibition opportunities in New York and elsewhere. It was within those circumstances that the artist abruptly announced that he was leaving the Pace Gallery, not to move to another established New York dealer, but to enter an exclusive relationship with a complete novice operating out of an industrial park in the St. Louis suburbs in a move that stunned close associates and art world observers alike. Immediately there was speculation that Trova had been forced out of Pace; However both Trova and Paces Glimcher dismissed that suggestion, each insisting at the time and again in later years that it was Trovas decision to end the professional relationship. In the 1980s Ernest Trova was far from a top priority of the Pace Gallery, and the suggestion that an artist in a similar position might switch representation would usually be a footnote to that artists career. Artists frequently move from one gallery to another, and their livelihoods tend to travel along with them more or less intact. But Trovas announcement was as unusual as it would be catastrophic, not only due to his new dealers inexperience and location far from the art centers of the world, but also the scope of the agreement Trova had entered into, which granted almost total control of his art past, present and future to an individual whose sum total of professional art experience had been publishing one obscure limited edition print. The man that Trova had signed on with was ______________, the heir to a sewing supply business with no background in art. In the highly irregular arrangement the two men concocted, Trova sold his new dealer virtually the entire contents of his substantial studio collection in addition to extending the sole rights to his future output, for which the artist would receive a commission of only ten percent. For his part, Trovas new dealer agreed to fabricate anything the artist was inclined to, funding the extensive production costs Trova had been responsible for under his informal arrangement with Pace, as well as opening an exhibition space and foundation to exclusively display Trovas work. The contract was unconventional from the start, but it was not initially unproductive. With all of the new resources now at his disposal, Ernest Trova returned in full to the Falling Man sculpture that had slowed in the preceding decade, and unrestrained by the prohibitive costs of production that had very often been his de facto editor, Trova produced some of his most complex meditations on his major theme. Trova took full advantage of ______________s financing to produce more than twenty major works, arguably even overindulging in his sudden freedom to create, allowing dozens of Falling Man configurations to be produced in inadvisably large editions. Unchecked by the more savvy voices at Pace Gallery that had once guarded Trovas output, under his new arrangement any given sculpture would usually be issued in editions of eight plus two artists proofs, and then in three different sizes, creating vast inventories and significant pressure to sell work quickly, all within a market for Trova sculpture that had already been weak with Pace and further diminished by the artists exit from the legitimate art world apparatus. The artists new representation did not demonstrate any similar restraint, and with Trovas unwise endorsement also produced over 30 inconsequential table-top sculptures in editions of 99 plus 6 artists proofs apart from the many larger sculptures, releasing more than twice as many small-scale multiples in two years than Pace had in the past twenty. Usually consisting of colorful abstract models adorned with extraneous six-inch Falling Man figures, these maquettes were positioned far from the ephemeral trinkets that Trova had previously incorporated within his practice and uncomfortably near to his more admirable sculpture. Even though most of the editions were never completed, the perception of a huge supply and a diminished seriousness had been cemented through an aggressive advertising campaign and a network of lowly galleries Trovas new dealer had cultivated to market the less expensive artworks. By the time Ernest Trova had become distressed enough by his deteriorating reputation to take legal action, he was essentially trapped in a device of his own design, stuck in the unenviable position that even if he refused to make another solitary sculpture, ______________ already had enough of his art in fabrication, in addition to the purchase of Trovas studio contents, that he could go on marketing the work for years (or as it would turn out decades) without the artists cooperation. At the same time, Trova was contractually not allowed to make more than four artworks per year that wouldnt be the property of ______________s art operation. Within a few months of making their deal Ernest Trova and ______________ were communicating almost exclusively through intermediaries. Still somehow their misbegotten arrangement was able to continue for several more years. The conflicts did not reach their apex until ______________s refusal in 1992 to authorize the casting of a new group of bronzes left the artist with little choice. Denied access to his fabrication facilities and contractually disallowed from producing the work on his own, Trova finally sued to be released from what had become an irreconcilably oppressive partnership. For Trova the worst repercussions of his misadventure had yet to be felt, as facts that would come to light in the course of the legal proceedings made all of the damage to Trovas reputation and career seem routine. As Trovas suit and ______________s countersuit progressed, the discovery phase exposed what must be among the gravest misdeeds ever perpetrated on an artist of even minor significance by those they had entrusted with their work. Meticulous spreadsheets and hundreds of photographs showed that ______________ had been engaged in the secret destruction of Trovas artwork over the course of several years. In all ______________ had ordered over 1,300 pieces of Trovas art to be destroyed, more than half of which were unique sculptures and paintings, all along paying the artist his commission on the ruined works as if they had been sold. The photographs ______________s staff maintained to record their handiwork more closely resemble crime scene photographs than fine art documentation: early works sledge-hammered apart, bronze figures sawed into a dozen pieces, piles of trashed sculptures littering a concrete floor. Almost as troubling as the destruction itself were the methods used to determine whether any given work of art would be allowed to exist ______________, with no art expertise of his own, would stage line-ups where he could solicit the equally unqualified opinions of his employees. The fact that the restoration of supposedly damaged works was never undertaken, and that works deemed undesirable werent simply stored away or returned to the artist, indicate other possible motivations to destroy Trovas art. I really didnt do anything intentionally with the idea I was going to be writing things off on taxes, or I was going to be getting even with Mr. Trova or anything like that, ______________ testified under oath. However, the circumstances suggest that the motivation to eliminate Trovas less marketable art may have had much more to do with the federal tax code than any act of connoisseurship: Unlike most primary market dealers who hold an artists work on consignment, ______________ owned his inventory of Trova artworks outright and had invested millions of dollars in the promotion and production of work by an artist who now refused to speak with him. At the same time the art market was in a severe downturn, further hurting prices and demand, leaving ______________ with substantial tax liabilities unlikely to be met through the sale of Trovas art. As the longtime operator of a large manufacturer, it is hard to imagine that ______________ would not have been aware that Federal tax law allowed for a hefty deduction on the value of excess or obsolete inventory that was destroyed, donated to charity, or sold to liquidators. Of those write-offs only the destruction of the art would remove their value from the books while at the same time assuring the unwanted artworks didnt ever come to market to compete with ______________s ongoing interests. Documents submitted to the court show that 1,371 artworks valued at $3,545,350 (more than $5,000,000 in 2009 dollars) were recorded to have been destroyed, and one can only assume that it would have been unlikely for anyone to have failed to write off millions of dollars in losses when legally permitted to. If Trovas works were destroyed for tax reasons it would also explain the existence of the hundreds of before-and-after photographs taken of each artworks destruction, which would potentially be needed to prove the loss to the Internal Revenue Service. That so much of Trovas artwork was destroyed is a fact, although exactly why ______________carried out the destruction remains speculation, as his lawyers were careful to have a protective order from the court preventing disclosure of the related tax records. In the past 16 years absurd exhibitions and gallery affiliations were regularly organized with Trovas name but against his will by vulgar speculators that still hold scores of his artworks. Trova himself would not have meaningful gallery representation outside of St. Louis again in his lifetime. When Ernie left here he didnt go with another good gallery, which he should have. He should have gone with another New York establishment, but when you take yourself out of that you become a local figure, Arnold Glimcher said. That is certainly true, but even in his native St. Louis Trovas reputation had been diminished to such a degree that it went unnoticed throughout the 1990s when the local sculpture park (which Trova had been instrumental in founding) allowed many of his outdoor works to rot, and damaged many others with modifications and flawed restorations. In 2005 a local critic singled out a Trova sculpture as worst in show when reviewing a group exhibition that notably included the artwork of several near-amateurs. The St. Louis Post-Dispatch had to print a correction when it prematurely referred to him as the late Ernest Trova several years ahead of his actual passing, and the citys free weekly tabloid felt inclined to publicly wonder if Trova had been a hack just a few days after his actual death.ix Outside of St. Louis, Ernest Trova was less abused and more simply forgotten. When asked about leaving the Pace Gallery, Trova was always quick to admit he had made a grave mistake, but would also point out that the sculptures he completed while with ______________ are some of his strongest artworks, benefiting from the long distillation of his formal vocabulary and the improved fabrication techniques ______________s financing afforded him. There is no question that the Faustian bargain Ernest Trova struck gave him the means to make art he could not have made otherwise. While one might have guessed that his career would be destroyed by the move out of New York, it seems fair to say that no one could have imagined that the physical destruction of much of his lifes work would result from his decision. Trovas public career imploded as a result of his profound misjudgment of both people and art world mechanisms, but his artistic output went on uninterrupted, and his art rarely failed to reflect his incredibly refined inventiveness. Regardless, as it stands today Ernest Trovas art is in a kind of purgatory the judgments of past art world generations loosing currency with every day that passes, and todays tastemakers largely unaware he ever existed. For more than twenty years the marketing of Trovas art has been an impediment to the appreciation of the philosophical acuity that informed his most resonant paintings and sculptures. As with most artists as prolific as Trova, his total body of work is uneven, full of fits and starts, but while his least interesting work may seem too casually conceived or too deeply connected to the years in which it was made, his best works are timeless, morose and uniquely comic expressions of the human condition. To date no one has cared to make those distinctions, and its a broad disinterest that isnt difficult to understand, reinforced by the demeaning circumstances Trovas art is usually found in today. It doesnt mean that those early works wont come around again I think they certainly will. Theyre wonderful works. But in the contemporary face of whats happened to the work theres less interest... As time continues I think those early works will become isolated as major works, Paces Glimcher said in closing. Ernest Trova (1927  2009) is the first serious consideration Trovas work has received in more than a quarter century. While Trova also worked in purely abstract modes, it is his treatment of human forms that unifies his most satisfying efforts and to which this exhibition restricts itself. Trovas predominant impulse may have found its most extraordinary expression in his Falling Man, but Ernest Trova (1927  2009) prefers not to establish him as an artist strictly of that one outsized success. While none of Trovas other art found the same audience, Falling Man emerged from many independently accomplished series of paintings and sculpture, and developed into many persuasive explorations of his underlying ontology. Ernest Trova (1927  2009) does not make grand claims for Trova as a major artist of the first order or anything else that he was not, but simply for Trova as an underestimated artist of eccentric gifts deserving of a greater position in the history 20th century figurative art. A version of this text accompanied the exhibition Ernest Trova (1927-2009) at White Flag Projects, St. Louis. i While Trova was selected to represent the United States as part of three Venice Biennales (1966, 1968, and 1970) he never took part. ii This and all other Arnold Glimcher quotes are taken from a recorded telephone interview in December 2003.
iii This and all other Richard Solomon quotes are taken from deposition transcripts recorded in 1993.
iv Arnold Glimcher and His Art World All Stars, The New York Times Magazine, October 1993, and "The Ten Commandments of Taste," Art & Auction, November 1992.
v These accusations are made in a letter dated July 11, 1991 to Trova from the then Director of Creative Affairs at ______________Fine Art. vi This and all other ______________ quotes are taken from deposition transcripts recorded in 1993.
vii In 1986 and 1987 Trova had agreed to donate or dispose of 111 models and pieces of sculpture, and to the elimination of 182 prints that had been improperly signed. There is an important distinction to be drawn that signed documents were produced to authorize the destruction, and that the artist was not paid a commission. viii The Artist Rights Act of 1990 prevents any intentional distortion, mutilation, or other modification of that work which would be prejudicial to the honor or reputation of an artist, and prevents any destruction of a work of recognized stature.